As we entered November in 2015 we anticipated a fantastic season finale. If the first half of the season was anything to go by we where destined to finish with a bang! November is our teams’ favourite time to visit Guadalupe as this is the time when we see those famous huge females……..we where not disappointed………………. For our final 3 trips of the 2015 season we hosted specialty expedition by some vary experienced shark experts and researchers. First up was a specialty expedition ran by Alessandro De Maddalena. This was Alessandros’ first ever trip to Guadalupe and although the weather was not on our side for part of the trip we still saw an incredible amount of sharks and had arguably the best single day we have ever had at Guadalupe encountering multiple sharks at the same time, all over 15ft in length! Those encountered included “Big”, “Herman” and “Heracles”. Next was Ralph Collier who teamed up with Edgar Becceril to conduct tagging of the sharks during his expedition. It was a great success with many sharks tagged including biopsies taken giving the guests a unique trip and insight to Guadalupe Islands shark population. During our final day we encountered “Tail Scratch”, one of the biggest sharks ever recorded at Guadalupe at around 17ft in length! 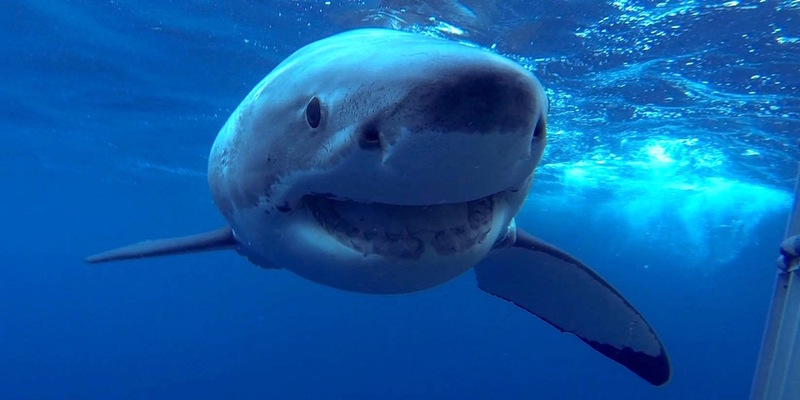 ‘Tail Scratch” was famously filmed for shark weeks “Island of the mega shark” filmed with us in back in 2014. Finally we hosted Michael Domier and Nicole Nasty Lucas of MCSI and a host of celebrities and friends. During this final trip we spent two full days with another classic Guadalupe female, “Scarboard”. She is a shark that we see every two years and we had predicted that we would see her this year. She left it late but when she did turn up we where very pleased to see her in good health and very active around the cages. Like “Tail Scratch”, “Scarboard” is around 17-18ft in length and is often accompanied by a host of pilot fish. She has been seen for man years and has also featured in many tv productions including “BBC shark” and “Jaws of the Deep”. Looking back on the season we have to say it was one of (if not the) best on record! We had incredible interactions with Hammerheads and Whale sharks that we have never had before and we saw more numbers of Great White sharks than ever before. Not only this, but the average size of the sharks seems to just be getting bigger and bigger as we are watching sharks we have come to know well “growing up”. We are now only a few months away from starting our 2016 season and still have spaces available for last minute bookings………….we would love to have you onboard……….